This unique roasting method that I am about to share will be the only way you’ll roast duck forever more. The traditional recipes for roasting a duck are time-consuming and laborious. It requires constant babysitting, flipping and rotating to get the bird to brown evenly. Then after all that work, you have a duck that looks great on the outside but is dry and leathery on the inside. You end up drowning it in pools of sauce to mask the dryness. Who wants that? Baking a duck in an oiled paper bag is a technique I’ve used to roast my Thanksgiving turkeys for years now. It was just recently that I adapted this recipe for a duck. The results–an easy recipe that guarantees a golden, juicy and delicious duck. Seeing is believing but you really have to try this recipe and taste the difference! Use only peanut oil and do not substitute with another vegetable oil. Peanut oil has a high tolerance for heat. Make sure to use enough peanut oil to saturate the paper bag. There should not be any dry paper visible. Do not use so much oil that the bag becomes soppy. Remove the duck from the fridge at least 30 minutes before baking to allow it to come to room temperature. Use a large orange to stuff the duck. You have to use a firm hand to push the wedges inside the body cavity instead of just placing them inside. This approach helps to build up the body and make it fuller. Tie the legs together. This also helps to puff up the duck. It will come out looking round and full as ducks have a tendency to flatten when roasted. Be sure to seal the bag well by folding the ends of the bag and stapling it securely. You don’t want any of the heat to escape from the bag while cooking. This is technique allows the duck to cook quickly while still remaining moist. The rule for cooking a duck using this paper bag method is 75% of the typical cooking time, approximately 15 minutes/pound. A 5-lb duck roasts for 75 minutes and then we broil for 15 minutes. When removing the paper bag, there will be lots of duck drippings on the bottom of the bag. Be careful with this as it’s extremely hot. If you’d like to keep it, dump it into a bowl and use it to make gravy, etc. Duck fat sizzles and splatters like crazy. During the final broiling stage (last 15 minutes) the duck fat will splatter everywhere and even smoke. This is why we don’t place the duck to close to the heating elements. Be extra careful when handling the roasting tray after this step. I typically turn-off the oven, let the duck and pan cool for about 5-7 minutes before removing from the oven. Lastly, it’s always important to let a duck rest for at least 15 minutes to seal in the juices before carving. Grate ginger, zest orange and crush garlic. Place in a small bowl. Add remaining marinade ingredients and combine together forming a soft paste. Remove neck, giblets, etc. from inside the duck and discard. Sprinkle salt on outside and inside of duck and rub into the skin. Rinse with duck with cool water and shake off excess. Pat duck thoroughly dry with paper towels. Place the duck in a baking dish. Drizzle Vodka 5-Spice Marinade on both sides of the duck and rub into the skin. Smear 1 tsp of marinade inside the duck. Spread remaining marinade on the duck coating it evenly. Allow to marinate in refrigerator overnight uncovered. 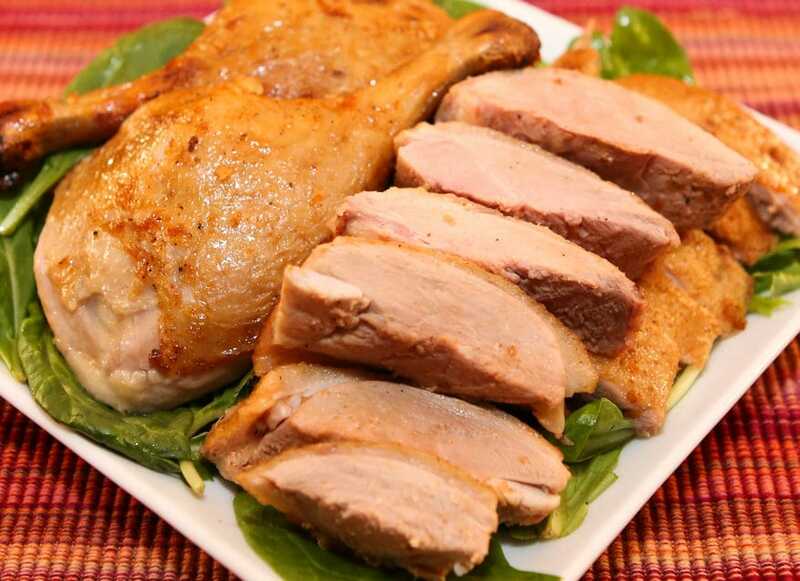 The next day, remove duck from refrigerator and allow to come to room temperature while continuing with next steps. Lower oven rack to lowest position. Preheat oven to 325 degrees. Coat paper grocery bag completely with peanut oil and allow to rest while continuing with next steps. To make a trussing needle, break off a 6-inch section of the bamboo skewer starting at the pointed tip. Place twine along the skewer starting about 2 inches from the tip. Wrap clear tape around the twine and skewer in a downward spiral. Twist the tape to make sure it’s securely fastened onto the skewer. Use the trussing needle to sew the opening closed. Pull twine taut and then cut off the bamboo needle. Tuck the remaining twine inside the duck Tie the legs together. Place oiled paper bag on the roasting tray. Place duck inside the bag positioning it toward the back of the bag but not touching the paper in the back or on the sides. Fold edges of the bag up and staple shut. While the duck is roasting prepare the glaze by combining all listed ingredients. Remove roasting pan from oven. Carefully cut paper bag, releasing the steam inside. Remove paper bag and discard. Place duck directly on the roasting rack. Adjust oven rack to one level higher and increase oven temperature to 450 degrees. Brush duck with generous amounts of glaze. Return to oven and bake for another 15 minutes or until golden brown. Remove from oven and allow to rest for 15 minutes before carving and serving. this is my 3 year making it after I discover your video…thanks…so GOOD!!! I am so glad to hear you like this recipe. I make it every year for the holidays too. Happy New Year to you! Hi Trang. Thank you for your video! This will be my first time roasting a duck, let aline using a bag. Very neat trick to roasting. I have followed your instructions to the T, I’m hoping i get beginners luck. Im taking this duck to my sisters house today. I hope they like it, it smells great already. * note: i looked up the temperature for peanut oil not recommended for high heat it states canola oil is best for high heat. Thats the only thing i changed i didnt want to chance it. Thanks again! Either canola oil or peanut oil will work well but we’re not cooking anywhere near the smoke points of these oils. 🙂 I am excited to hear how the duck turned out!